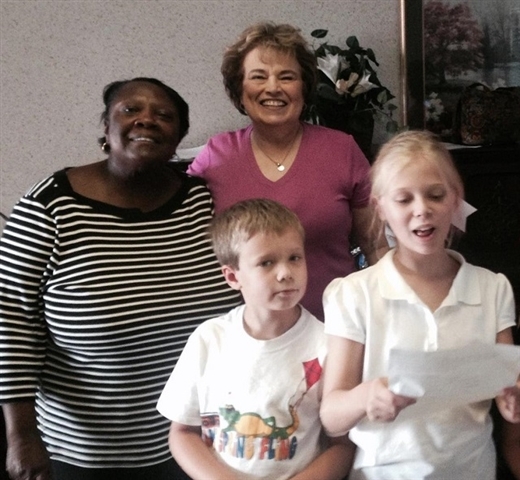 During an early dismissal day for students in St. Charles Parish elementary schools, several of the children from New Life Community Church (the joint ministries of Luling United Methodist Church and First Union Presbyterian Church) entertained residents of the Luling Living Center and the Ormond Nursing Home with song. Volunteers sang hymns, patriotic songs, and numbers like "She'll Be Coming 'Round the Mountain" and "When the Saints Go Marching In." Pictured are Dianne Powell, Sue Triche, and Thomas and Emily Adcock.